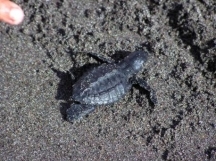 Turtles in Panama – anywhere, for that matter – have the odds of survival stacked against them. One man tries to tip the scales in their favor. It is a warm October night on La Barqueta beach on the western edge of Panama. The moon occasionally peers out between small grey clouds. The beach is deserted except for the dark lumbering shape that is slowly emerging from the ocean. The 88 lb. Olive Ridley turtle painstakingly struggles up the beach. She is oblivious to all around her – she is a mariner on a mission. At the nearby sand dune, she digs down about 15 inches and deposits a clutch of 110 small white eggs. Carefully, she uses her flippers to cover her brood and then she struggles back to the ocean. The eggs will take about 50 days to incubate in the sands of Panama, all the while at the risk of being destroyed by animal and human predators. At dawn the next day, the solitude of the beach is broken by the figure of a young man running. For 15 years, Marcial Rojas has used this cool, peaceful time of day to indulge in his passion for exercise. As he runs, however, his eyes are constantly scanning the sand for the tell tale signs of turtle activity. Sure enough, he spots the flipper tracks that lead to last night's egg deposit. Marcial carefully removes the eggs and takes them to his own nearby sanctuary. Inside a wired off enclosure the eggs will remain in security until the time for the hatchlings to start their own great marine odyssey. It is now 3:30 in the afternoon of November the 25th at La Barqueta Beach. The 110 four-inch-long Olive Ridleys are ready for a swim. Marcial has gathered them into a large Styrofoam cooler and placed them about 100 feet from the water. 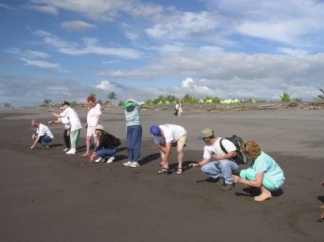 A large group of nature lovers has driven down from the mountain town of Volcan to watch and assist in the release. Marcial, like a proud father, marks out half a dozen small circles in the sand into which he places the small black turtles. The turtles instinctively starting waddling toward the ocean. (If mother could see them now, I am sure she would be proud!) A variety of cameras, still and video, record this effort to redress man's previous indifference to nature. 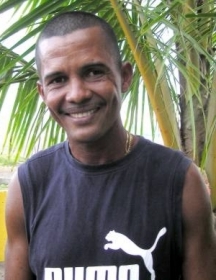 Marcial Rojas is instrumental in saving and releasing about 3,800 turtles in Panama each year. A week previous, he had released over a 100 leatherbacks. In his 15 years, he has helped over 40,000 turtles in Panama from incubation to release. He uses his own money, and receives no outside financial help. One by one, the small Olive Ridley turtles make it to the water. Today, they are protected from scavenging birds by the small admiring crowd of nature lovers. These amazing creatures have been documented as traveling over 1,600 miles in 113 days. Birding is a major tourist attraction for Panama. This little spindle of land between two great oceans and two great continents has more birds that in all of North America. Drive five minutes from Volcan, to the beginning of La Amistad International Park on the border with Costa Rica, for a surreal view of Panama's wonderful natural diversity – and a good view of the dead Indian.